Domestic Sugar: Because Domestic Life is SWEET! Recipes and Ideas forged through Domestic Ideology. This cake was my fun! 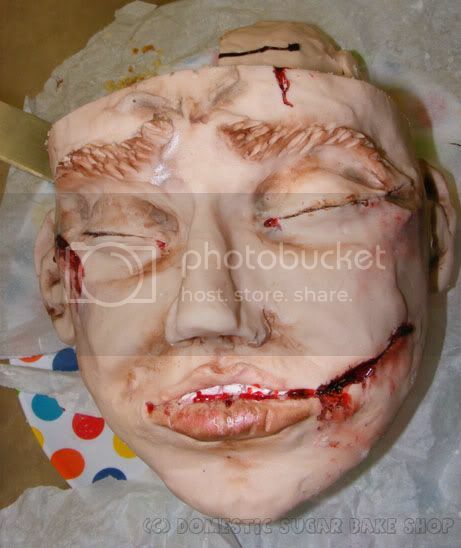 For years now, I've wanted to make a head cake, or a zombie cake; this year, I followed my dreams! My husband took one look at this and judged it! His response: It is horrid! Not in the bad way, but in the Uncanny Valley way. The uncanny valley is a theory of robotics where things look so real that they are disturbing, rather than interesting. Hubbie was disgusted, as were my coworkers! I wanted originally to do a step-by-step, but I didn't. Sorry! Instead, I took a few photos, well, my husband did, and I can show you the parts. 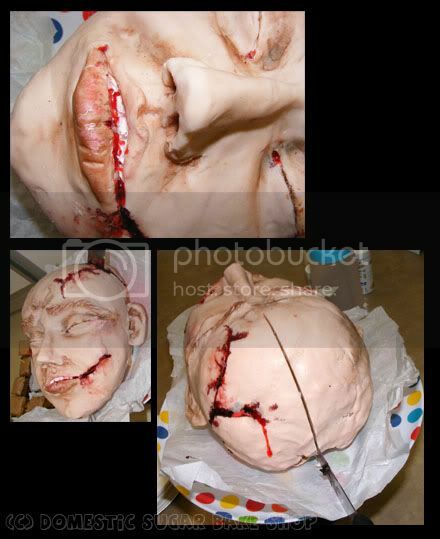 I started out with three 6-inch cakes, stacked them in a slanty way, and began to carve them into the shape of a face. Next, and this is where I could not take photos, I used my 'mastery' of sculpting (not really), and covered the cake in modeling chocolate. 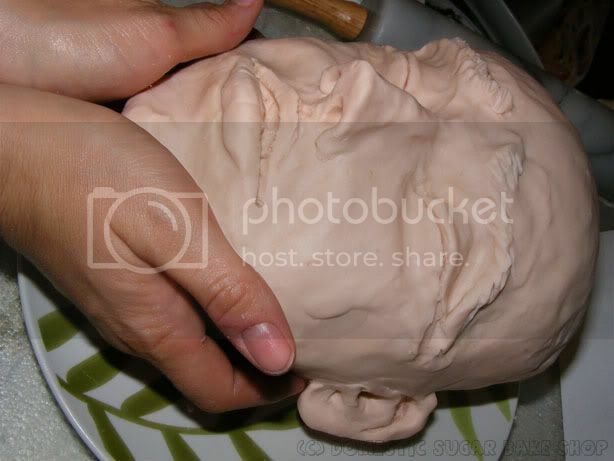 This is a sculpting part, I am sure you can buy face molds if you look hard enough, but if you want it to be personal, use your creativity, explore pictures of faces, then try to re-create your own design. I used bits and pieces to piece together the face (working on muscle groups etc), making it look dead, and a little upset about it. LOOK! IT'S THE SAME SIZE AS MY FACE! Finally, using cocoa powder, I brushed on some shade into the face. Then I used some luster dust (purple, pink and blue) to make cuts look like they are bruised. 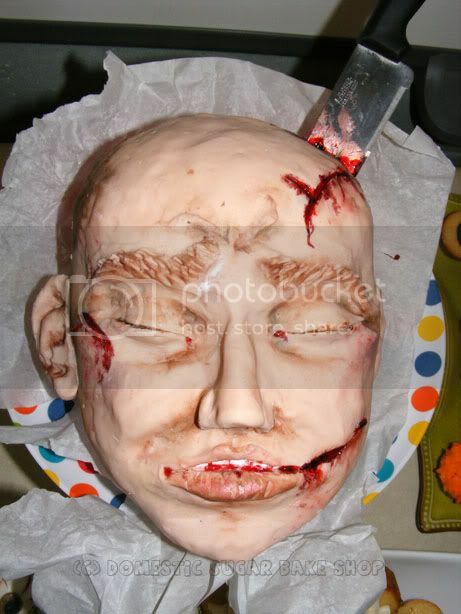 I scored the face with wonderful cuts, and added some corn syrup (dyed red and brown) to make it look like shiny blood. This head looks a little upset about the whole thing. There you have it! My head cake. I had a blast doing this. Modeling chocolate is so easy to work with, I'll post up a nice tutorial later on! But for tonight, scary movies and pizza. The costume dragged on the ground all day... I was amazed that only one kid tried to climb under the dress. Good thing I was wearing pants under it! whoa awesome gross! I love your costume!! Creepy, but cool. Love your costume!! 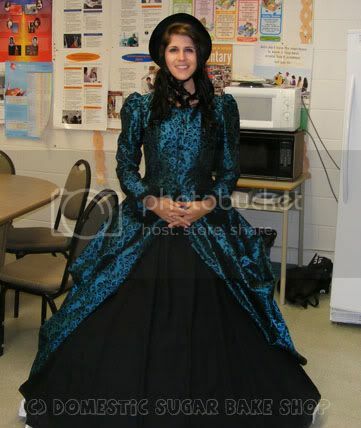 What a pretty dress!! This is totally gross, but it's awesomely eye catching! You've got skills! That is so incredibly disgusting it's AWESOME!!! Great job! 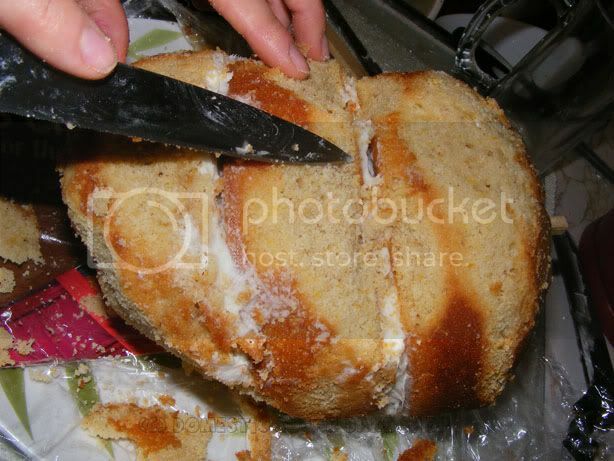 So many words come to mind; gruesome, scary, gross, ewwwww, ick, and WOW!! You're very talented! Good job!!!! That's probably the most perfect Halloween cake I'll ever see! This is too much! Love the cake! Thanks so much for sharing at Mom On Timeout! This is crazy realistic awesome! 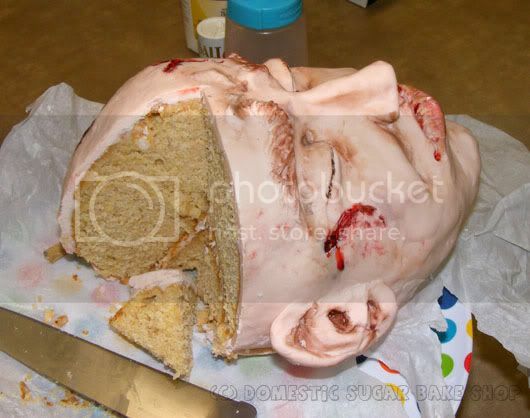 The only thing that would make this more awesome than it already is, would be to make this a "poke cake" and use red jello --- the head would look like it has blood in it! Something Evil this way Comes! Rainbows, Butterflies, and a girl's dream! (C) Domestic Sugar Bake Shop. Cupcake Cat (C) Sugar Bunny Shop. Powered by Blogger.